Knoxville, Tennessee (March 29, 2017) – Regal Entertainment Group, a leading motion picture exhibitor owning and operating one of the largest theatre circuits in the United States, and Coca-Cola announced Julian Conner and Tom Teller from Chapman University are the winners of this year’s Coca-Cola and Regal Films program for their film “Crunch Time” which can be viewed at https://youtu.be/-ESDWzAuraY. Julian Conner and Tom Teller were named the 2017 grand prize winners at CinemaCon, the annual gathering of the motion picture theater community, in Las Vegas. A Red Ribbon panel comprised of Coca-Cola, Regal, RED Digital Cinema (RED) and entertainment and industry representatives, including Actor and Producer Giovanni Ribisi, Actor, Director and Writer Clark Gregg, and Director Richie Keen, selected this year’s winner based on set criteria: creativity, creative fit and entertainment value. Julian Conner and Tom Teller’s 35-second film will be shown exclusively at Regal theatres across the country starting in May. Students from more than 20 top college and university film schools participated in the 2017 Coca-Cola and Regal Films program. Five teams from American Film Institute, Chapman University, UCLA, Elon University and New York University advanced to this year’s finals and received $15,000 to create a 35-second film to connect consumers to the movie-going experience. In addition to the grand-prize winning film debuting at Regal theaters, RED, the program’s provider of professional technology, gave camera equipment for each production and awarded the winning filmmakers with a SCARLET-W 5K camera package and Chapman University with a RED EPIC-X 6K camera package. Their short film “Crunch Time”, is about a robot standee that comes to life in the lobby of a Regal Cinema, when it is enticed by the sights and sounds of the concessions. Driven by the irresistible crave, the robot decides to leave its own diorama and head into the theater and join other guests, with a delicious, ice-cold Coca-Cola and popcorn in hand. The six-month Coca-Cola and Regal Films program gives aspiring film students real-world experiences managing all aspects of filmmaking, as well as the opportunity to work alongside and be supported by teams at major global marketing and leading cinema and cinema equipment companies, The Coca-Cola Company, Regal and RED. 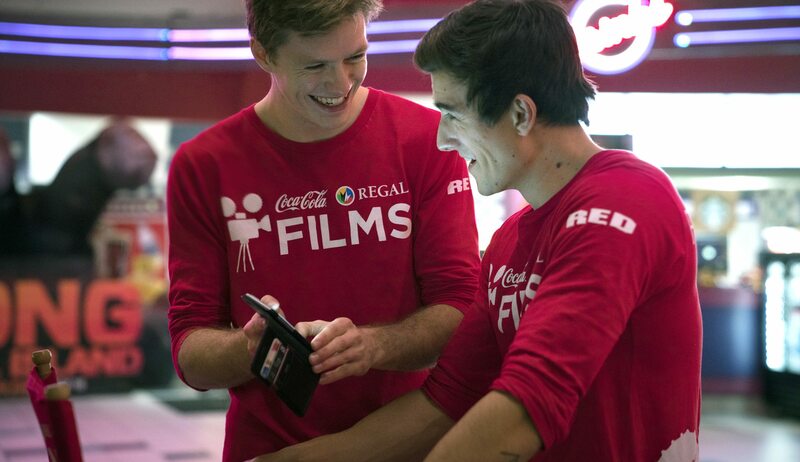 Regal and Coca-Cola partnered in 2016 to mark the return of this premier student filmmaking initiative to give aspiring student filmmakers an opportunity to share their talent. RED joined the initiative in early 2017. The Coca-Cola Company (NYSE: KO) is the world’s largest beverage company, refreshing consumers with more than 500 sparkling and still brands and nearly 3,900 beverage choices. Led by Coca-Cola, one of the world’s most valuable and recognizable brands, our company’s portfolio features 21 billion-dollar brands, 19 of which are available in reduced-, low- or no-calorie options. These brands include Diet Coke, Coca-Cola Zero, Fanta, Sprite, Dasani, vitaminwater, Powerade, Minute Maid, Simply, Del Valle, Georgia and Gold Peak. Through the world’s largest beverage distribution system, we are the No. 1 provider of both sparkling and still beverages. More than 1.9 billion servings of our beverages are enjoyed by consumers in more than 200 countries each day. With an enduring commitment to building sustainable communities, our company is focused on initiatives that reduce our environmental footprint, create a safe, inclusive work environment for our associates, and enhance the economic development of the communities where we operate. Together with our bottling partners, we rank among the world’s top 10 private employers with more than 700,000 system associates. For more information, visit Coca-Cola Journey at www.coca-colacompany.com, follow us on Twitter at twitter.com/CocaColaCo, visit our blog, Coca-Cola Unbottled, at www.coca-colablog.com or find us on LinkedIn at www.linkedin.com/company/the-coca-cola-company. Regal Entertainment Group (NYSE: RGC) operates one of the largest and most geographically diverse theatre circuits in the United States, consisting of 7,267 screens in 561 theatres in 42 states along with Guam, Saipan, American Samoa and the District of Columbia as of December 31, 2016. The Company operates theatres in 46 of the top 50 U.S. designated market areas. We believe that the size, reach and quality of the Company’s theatre circuit not only provide its patrons with a convenient and enjoyable movie-going experience, but is also an exceptional platform to realize economies of scale in theatre operations. Additional information is available on the Company’s website at www.REGmovies.com.